This high precision pin vise handle is machined from the finest material, nonrolling gold-anodized aluminum, which makes it lightweight and versatile. It comes complete with a precision drawbar for positive collets chuck clamping. It features an 8 mm (0.31") hexagonal barrel dimension by 100 mm (4") long (overall length is 115 mm fully assembled) and it has a knurled finger-grip for positive precision control for handling and tool manipulation. 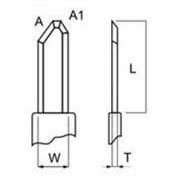 The vice is supplied with a standard collet chuck opening of 2 mm (0.78") diameter and will hold a selection of our specially designed tools - and collets adapter 0.8 mm (0.003") for diamond stylus chucking. "PTFE" coated nickel stainless steel wire with flat ends. 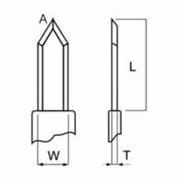 0.105" (2.7 mm) dia.x8¼" (210 mm) long. Tapered to 1/8" (3 mm). 0. 156" (4 mm) dia.x7¼" (184 mm) long. 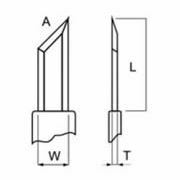 0.156" (4 mm) dia.x7¼" (184 mm) long, tapered to 1/32" (0.8 mm). A Heyman type micro spatula made from nickel stainless steel with a glazed finish. The wire diameter is 0.103" (2.62 mm). Overall length: 6¼" (159 mm). 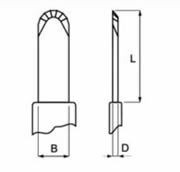 Flat end: 1¼" (31.35 mm) long. The spoon end: ½" (12.5 mm) long x 1/8" (3 mm) wide. A Heyman type micro spatula made from nickel stainless steel with a glazed finish. 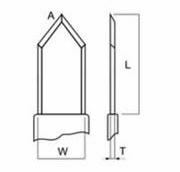 The wire diameter is 0.103" (2.63 mm). Overall length: 6¼" (159 mm). Sharpened bent end: 1½" (37.5 mm) long. V-Shaped formed other end: ½" long. This is a sword type spatula, made from stainless steel with a wooden handle. 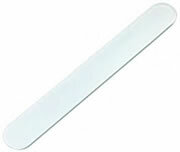 This spatula is very thin and has bendability toward the end and very stiff towards the handle. It offers flexibility when working with soft materials, such as embedding waxes. The overall length is 6¾"
Made from polished stainless steel. 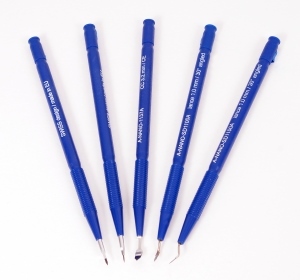 They are ideal for applying wax to glass knives, colloidal adhesives to stubs, and for mixing embedding resins. 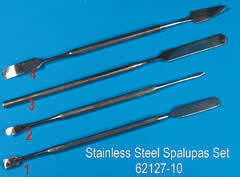 We offer a selection of stainless steel spatulas - a "must tool" when handling embedding wax. A toothed wheel is turned by a finger making the spatula blade vibrate. This action allows for accurate adding of material. Plastic handle, stainless steel blade with "PTFE" coating. Style 1 is 7" (19 cm) long, large blade. Style 2 is 8¼" (21 cm) long, small blade. Its unique shape means no more material loss!!!! This utensils specially curved shape permits contact with all corners of bottles and containers; therefore, no loss of material occurs. Crystals, powders, granulated and solid substances, and even thick liquids are easily retrieved and never fall back into the container. The Ellipso-Spoon® Sampler has a spoon end and a spatula end and is made from polished stainless steel. Stainless steel with "PTFE" coating. One end has a square trough, which holds about 1cc. 26.7"long. Long-handled spoons are ideal for acquiring samples from bottles, jars and other confined areas and helping to avoid personal contact with sample materials. A flat edge on the rim of each bowl allows fast leveling to collect and measure small amounts with accuracy. Available in three bowl sizes, each spoon is 17.8 cm (7") overall length. Non-sterile and translucent in color. Perfect for retrieving small, specific volume samples of powders or liquids. Wide handles let you grip firmly and provide just enough stiffness to easily sample packed powders and other firm materials. Their unique flat bottom shape allows convenient dual use as weighing boats to save time and assure accuracy. Nonsterile and translucent in color. Whether you are mixing samples, handling capsules, scraping containers, or positioning solid samples under examination, these sticks are ready to assist! Non-sterile and translucent in color. The sticks measure 14.6 x 1.9 x 0.15 cm (5¾ x ¾ x 1/16"). 5/32" (4 mm) diameter stainless steel rod, flattened at one end to give a 8x51 mm blade. The other end has a 13 x 25 mm spoon. The blade as well as the spoon is coated with "PTFE". 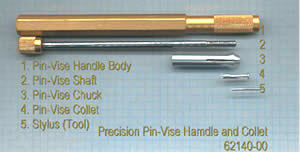 Overall length 9" (229 mm).